Free chips & Guacamole at Chili's with purchase of 1 adult entree. 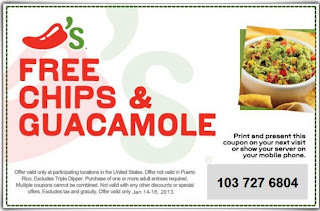 Just print the coupon or show the server on your phone and take it in to your nearest Chili's to redeem it. This offer good from January 14 through January 16, 2013.